Congratulations to County of Wetaskiwin CAO Frank Coutney for three decades of exemplary dedication and excellence! CAO Frank Coutney prepares to cut the cake celebrating his 30 years with the County of Wetaskiwin. After the County Open House was complete and mostly packed away, the County Council, Administration and Staff gathered to honour Chief Administrative Officer Frank Coutney upon his 30 year anniversary with the County. 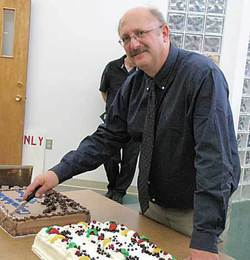 The celebration, complete with a chocolate cake and a fruit-filled cake, was a surprise to Coutney. He was briefly at a loss for words, then thanked everyone for their work on the Open House, calling it a celebration of what they do. Then he stated that the reason for the work done there was to provide services, doing the best with the resources available. He expressed appreciation to everyone, to all the councils, for help in so doing. Going back in time, he reminisced about his first day at work for the County of Wetaskiwin. The preceding CAO met him, filled him in on the situation, and told him to go sit in his office and stay there. The eight workers came in for their first day back after a strike, and they were not happy and let it be well known. It was a bad scene. By afternoon, only three workers were left. With a determination to be committed, to be part of the solution instead of part of the problem, to have a positive attitude, he sought to hire the right people for the right job, and today a much larger staff came together with joyful enthusiasm to honour their leader. Present was a former county worker who had bailed out shortly before Coutney joined the staff, and who now expressed regret for leaving then considering what the County would have offered in light of the present. Brian Bowles, County of Leduc Manager, was present, and spoke of starting with Coutney in Barrhead, and spoke of Coutney's dedication to his job and staff, his wealth of knowledge, his thorough knowledge of the Municipal Government Act which is the guide to what can and can't be done by a municipal government, his pro-County position. One of the men on council spoke privately of Coutney as a best friend and told how he backed council decisions, right or wrong, and followed council direction, right or wrong, while doing what he was asked in a timely fashion and putting in many extra hours. He remarked on Coutney's “unheard of quality of dedication” and how he built the staff culture of today which is a cross section of society with a complete mix. He noted how the staff respect Coutney, how they all poured in to honour him on this occasion. Congratulations to County of Wetaskiwin CAO Frank Coutney for three decades of exemplary dedication and excellence!